The Borletti-Buitoni Trust was established with the aim of providing flexible and innovative support to a talented new generation of classical musicians. Working in partnership with music industry professionals the Trust nurtures selected musicians by encouraging their musical growth and providing an extended platform of opportunities. 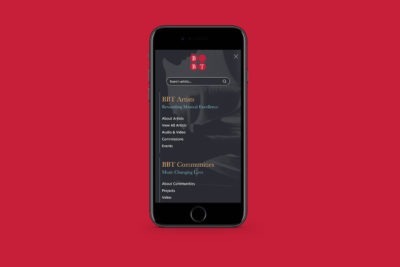 We have worked closely with the BBT team for over a decade to create a comprehensive yet intuitive website which is in keeping with the trust’s revered stature in the world of classical music. This includes an ever growing collection of audio and video content.